For those yearning for infinitely more fun in the shower, Hansgrohe offers overhead showers with extra-large spray discs. These rain showers measure up to 600 mm in diameter and are lavish in terms of comfort. Trendsetters here are: Rainmaker Select showers, which set aesthetic highlights in modern bathrooms with their clear-cut design and space-creating character – and are also setting trends in the project business. Not only do Rainmaker Select showers dispense water beautifully over the body, they are also attractive from an ecological point of view: in the EcoSmart variants, they consume only 9 litres per minute. 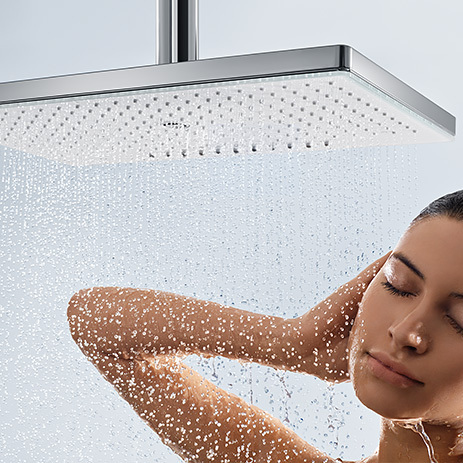 The fun of “showering large” and water efficiency therefore go hand in hand at Hansgrohe.